One of my favorite things about summer is juicy stone fruits! What’s a stone fruit? Well, it’s anything with a pit in the center – think plums, juicy peaches, nectarines and apricots. For some of you, visions of apricots and peaches may conjure up memories of canning with grandma. For others, they were the summer treat to enjoy under a shady tree with friends. Fresh-picked, sliced in a salad, baked in a pie, or shaken in a cocktail… the possibilities are endless. And who does not like homemade Ginger Peach Sorbet! It’s easy to make. I like those freezable crank ice cream machines. Just keep the bowl part in the freezer so you’ll be ready to whip up a batch anytime. For the adults try my recipe for a blended Peach Whiskey Sour, great to serve a crowd at a patio party. And for those of you that live in the Northwest – Metropolitan Markets is celebrating Peach-O-Rama with juicy ripe super sweet peaches with a Brix level (sweetness) that is around 15 – sweet! Place sugar, ginger and water in a small sauce pan, stir and bring to a boil. Let cook about 3 minutes. Remove from heat and let cool to room temperature. Meanwhile, peel and pit peaches. If peaches don’t peel easily, then plunge them into a pot of rapidly boiling water for about 30 seconds and then into cold water to loosen skins before peeling. Place peaches and lime juice in blender and puree until smooth. Combine peach puree with cooled ginger mixture. Chill mixture at least 30 minutes. Place mixture in an ice cream freezer and freeze according to manufacturer’s directions. Cocktails sweetened with honey are perfect to sip on during these warm, summery evenings. And honey syrup is an easy way to that touch of sweetness instead of traditional simple syrup. Just combine 1 part warm water with 1 1/2 parts honey, stir till dissolved, and keep refrigerated for up to a week. My Liquid Kitchen 5130 Honey! Use it in any of your favorite recipes that call for simple syrup, such as a margarita. Or whip up a pitcher of Summer Honey Lemon Collins that you can get creative with. Some fun local fruits and herbs (think strawberries and basil) and squish around with a wooden spoon to meld the flavors. Fill with ice, stir and enjoy! In a large pitcher, stir the wine, liqueur and honey together until honey is dissolved. Add the fruits and stir, crushing some of the fruit. Cover and refrigerate overnight, or for at least 4 hours, to let the flavors marry. Serve over ice, including some of the fruit in each serving. Recipe by Kathy Casey Liquid Kitchen®. When I was a kid, summer was full of freedom, adventures, and of course ICE CREAM! I can still hear the catchy jingle of the ice cream truck slowly turning the corner to go down my street. Today, the market is full of classic and snazzy ice creams, gelatos, custards, and frozen yogurt treats. But the classics are always a favorite. Take the ice cream sandwich as an example. Creamy, soft ice cream sandwiched between a pair of homemade cookies… now, that’s what I call heaven! With so many great ice creams on the market it’s easy to “sandwich” your own. How about Ben and Jerry’s Cherry Garcia – with chunks of chocolate and cherries folded into rich vanilla bean ice cream. Sandwich between Homemade Chocolate Chip Cookies with dried cherries and almonds – yes, please! Or Gingersnaps with Summery Local Peach Ice Cream – mmmm! And we can’t forget the ice cream float! The classic vanilla ice cream and root beer is always a favorite, but how about something different? Use locally made soda and ice cream with new flavors to take this to a whole new level! I like not-too sweet Vanilla Bean DRY Soda so d’lish when poured atop a big scoop of Molly Moon’s Honey Lavender ice cream. Now that’s a local float! A Boozy Shake: Spirited Chocolate Covered Cherry Milkshakes! For those looking for a more “adult” treat, check out my recipe for a Salted Caramel Coffee Spiked Milkshake in the latest issue of Sip Northwest Magazine. Made with vanilla ice cream, Hot Cakes Pacific Coast Sea Salt Caramel Sauce, and Rain City Spirits Drip Coffee Liqueur, this creamy deliciousness is then topped with whipped cream and my Liquid Kitchen Edible Cocktail Gold. The James Beard Foundation will be coming to Seattle as part of their Taste America: Local Flavor from Coast to Coast on Friday, September 26th and Saturday, September 27th! As part of their epicurean tour, Seattle has been chosen to host a weekend long tour celebrating America’s cultural diversity. The kick-off event starts on Friday at the Four Seasons Hotel with A Night of Culinary Star, an exclusive dinner created by All-Star Marc Murphy from New York City’s Benchmarc Restaurants, Tom Douglas, and Host Chef Kerry Sear. The night will start off with bites and sips from Seattle chefs, including Maria Hines, Jason Wilson, Rachel Yang, Renee Erikson, and Jason Stratton then lead to the amazing dinner. On Saturday, there will be a series of free events at Sur La Table in Kirkland including demos and tastings, book signings, and more. For dinner ticket prices and more information, check out the Taste America website. Everyone loves a great, fresh-off-the-grill burger. That smoky smell wafting from the barbecue just screams summer. And there’s a lot of room to get creative. From the burger patties to the buns and of course the toppings… it’s easy to make it your own! Love the classic beef burger? Snazz it up by stuffing the center with some blue cheese then serve it on toasted buns spread with garlic butter, tuck in some thick slices of vine ripe summer tomatoes, sweet Walla Walla onions and some tangy pickles. Don’t forget to use a signature spread! For this burger I love a mixture of A-1 steak sauce and mayo with a touch of horseradish for some kick. My Favorite Blue Cheese Burger Recipe follows. Who’s ready to take a bite out of My Favorite Blue Cheese Burger? And if you’re thinking seafood, then how about barbecued Salmon Burgers on Homemade Lemon Dill Buns. The buns are d’lish and this moist salmon burger is the perfect lighter option for an outdoor dinner party! Mix meat, salt, pepper, soy sauce, Worcestershire and garlic until thoroughly combined. Shape beef into 6 equal balls. Divide cheese into 6 pieces/balls and press into the center of the meat. Press out into 5 inch patties – – being sure that the meat is surrounding the cheese in the middle. To grill and serve: Heat charcoal or gas grill until very hot. Set patties apart on grill, turning when first side is browned. Cook to desired doneness, about 4 minutes per side depending on your heat. Meanwhile toast buns. Assemble burgers with spread tomato slices, onion, pickles, arugula or lettuce leaves and dollop with the Horseradish Spread as desired. Recipe from Kathy Casey Cooks: Favorites. Grilling doesn’t have to be about the obligatory hamburgers. Try something new – like salmon burgers. You can serve them with different condiments, too, such as cucumber Greek yogurt sauce, or tangy vegetable slaw. The bun recipe makes 8 buns, so you can easily double the burger mixture or use the extra buns for your favorite sandwich. To make the burgers, chop the salmon well. Mix it thoroughly with the remaining burger ingredients in a medium bowl. Divide the mixture into 4 portions and shape into 4 1/2- to 5-inch-diameter well-compacted round patties. Refrigerate the patties, covered for at least 30 minutes or up to overnight to firm. Prepare a very hot fire in a charcoal grill, or preheat a gas grill to high. The patties are somewhat fragile, so handle carefully. Oil the grill, and set the patties apart on the grill. Cook for about 2 minutes per side, or until nicely marked and just done. Split the buns and toast lightly. (You can also cook these on a stove top grill or in a non-stick pan). 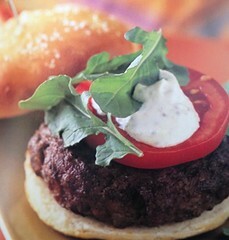 Spread the buns with mayonnaise or tartar sauce, add the burgers, and pile high with garnishes of your choice. In a small saucepan, bring the milk just to a simmer, remove from the heat, and stir in the butter and sugar. Cool, stirring until lukewarm. Add the warm water and yeast, stirring to dissolve the yeast. Let sit for 5 minutes, or until foamy. Pour the mixture into a large bowl. Whisk in 1 egg along with the salt, dill, lemon zest, and garlic. Then mix in as much of the flour as needed to make a smooth, moist dough. Turn out onto a floured surface and knead until smooth, about 6 minutes. Put the dough into a greased large bowl, cover with a damp towel or plastic wrap, and let rise in a warm place until doubled, about 1 1/2 hours. Preheat an oven to 350°F. Punch down the dough and divide into 8 pieces. Form the pieces into balls and let rest for 10 minutes, covered with a towel. Then press out the balls, flattening into 4-inch-diameter rounds. Place on a greased baking sheet, spaced apart, cover lightly with a towel, and let rise until almost doubled. In a small bowl, whisk the remaining egg with the 1 tablespoon water. Brush the tops of the buns lightly with the egg wash. Bake for about 20 minutes, or until golden brown.